When you spend a little time warming up before kickboxing, it may improve and enhance your workout. We are all pressed for time — sure skipping flossing this one time is okay, but skipping a warm-up can be detrimental to your workout. 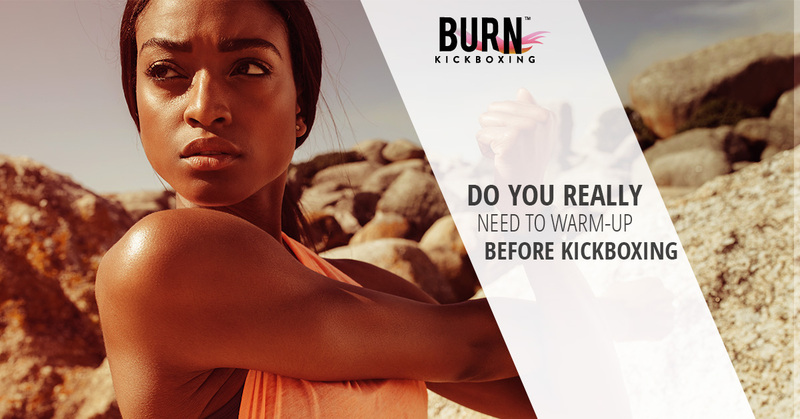 As you are eager to jump right into kickboxing, spending an extra five minutes warming up can only benefit you. At Burn Kickboxing, it is crucial that our clients get the best workout — which means getting in a warm-up as well. Examine the benefits of a proper warm-up as we venture into today’s post! The more strenuous the exercise, the more benefits you’ll have when you warm up. Below are a couple of things that begin to happen to your body as you warm up. As your temperature begins to slightly increase with a warm-up, it raises and warms your muscles — which is always beneficial. When muscles are warm they are relaxed and better ready for strenuous movement and are able to avoid strains and injury. Better blood oxygenation is always an advantageous thing. Things begin moving and you have a better endurance in your workout. Your mobility and range of motion increase. Along with your muscles getting warm, your joints and ligaments become better lubricated and less stiff which allows for a better range of motion. This translates into safer movements in your kicks, blocks, and punches in kickboxing. Your brain has a chance to catch up. When you take a moment to warm up, you are not only priming your body, you have a chance to mentally prepare. Warming up offers so many benefits including prepping your muscles and joints, getting your blood pumping, and helping you mentally prepare. Never miss a chance to work out with us! Schedule a kickboxing class today!